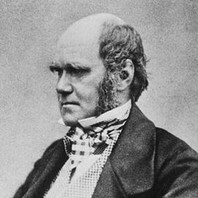 Father of evolutionary science whose 1859 book The Origin of Species first introduced the concept of natural selection. His theories, which helped support evolution, made him a controversial figure. There is no fundamental difference between man and the higher mammals in their mental faculties.... The difference in mind between man and the higher animals, great as it is, certainly is one of degree and not of kind. We have seen that the senses and intuitions, the various emotions and faculties, such as love, memory, attention and curiosity, imitation, reason, etc., of which man boasts, may be found in an incipient, or even sometimes a well-developed condition, in the lower animals.